Large Penthouse - Location, lifestyle, LOVE IT! The generous floor plan of this apartment, views and location are an obvious attraction with an internal floor area of approx 150m2 plus a sizeable balcony. The sun and views to the west are fabulous with an ever changing vista throughout the seasons. The near full height windows contribute to the light sensation and the spacious feeling throughout this home. There's parking for two cars and potential to add a large storage locker to help keep your apartment free of golf clubs, suitcases and other large items, there’s also plenty of storage within the apartment. 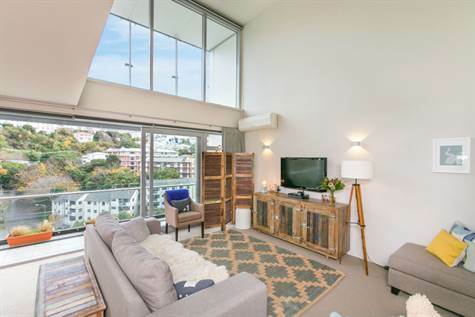 With the CBD on your door step, you are part of a thriving city with some of Wellington's finest shops, restaurants, cafes and the Waterfront all within walking distance. The location offers easy access off and on the motorway, save time and money travelling and have more time to do the things you enjoy with your family. The lifestyle this apartment offers is awesome.... you can watch a movie in the private theatre with friends, have a swim in the heated pool or a cardio workout in the gym all in the comfort of the climate control facilities without leaving the building. Zoned for Wellington Boys and Wellington Girls, there's plenty of space for a family to enjoy city living. It is no surprise why Montreaux Apartments are so popular, come along to the open home and see for yourself.